For all of you conversion rate optimizers out there: Google has advanced their in-page link attribution in Google Analytics. Before, if you had a web-page with two links pointing to the same internal URL you would not know which link users clicked. You would just know they clicked on a link of the two or three you have on a page. Now the data will specify which link the user clicked on. 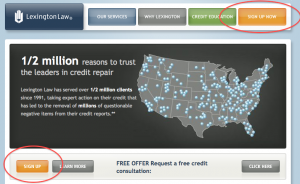 Sites that get thousands of visitors every day, like Lexingtonlaw.com (above), will now be able to see which sign up buttons receive the most clicks. Smaller sites, like this one your reading now, won’t benefit from this data as much just because the data set would be too small to make any rational decisions off of.